10,000 BC - 543 BC Prehistory. Austronesian migration. Microliths from heat-shattered quartz. Urn burials. 543 BC Year One in the Mahavamsa. Sinhalese settlers, led by Prince Vijaya, arrive from India. 300 BC Megasthenes, a Greek historian, mentions Sri Lanka in his writings. c. 250 BC - 200 BC Mahinda introduces Buddhism from India to Sri Lanka. 161 BC - 137 BC King Dutugemunu unifies Sri Lanka. 35 BC - 32 BC Pali Canon (Buddhist scriptures) committed to writing. 45 AD Envoys from Sri Lanka visit Rome. 303 - 331 Tooth Relic arrives. 412 - 413 Fa Xian visits Anuradhapura. 432 - 459 Tamil invasion. 459 - 477 King Dhatusena repels Tamils but is killed by his son Kasyapa. 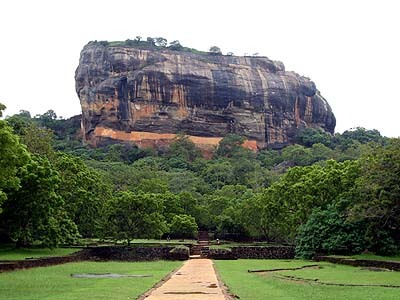 477 - 495 King Kasyapa builds Sigiriya but is defeated by his brother and commits suicide on the battlefield. 7th - 10th centuries A complicated time of alliances and conflicts between Lanka and several South Indian states, as: the Pandya, Pallava, Chola, etc. 1073 Native Sinhalese defeat the Cholas; new capital established at Polonnaruwa. Sculptures at Gal Vihara. 1110 - 1153 Rival capitals. 1153 - 1186 Reign of Parakrama I (The Great). Political reunification and building program at Polonnaruwa. 1187 - 1196 Reign of Nissanka Malla. Building program continues at Polonnaruwa. 1214 - 1236 Kalingan invaders destroy Polonnaruwa; ephemeral capitals thereafter. 1254 - 1324 Marco Polo visits the island. 16th century (1st half) Portuguese occupy the coastal areas. 16th century (2d half) Native Singhalese kings (Rajasinha I, others) and Portuguese puppet king (Dom Jao Dharmapala) vie for dominance. 1597 Native capital moves to Kandy, holds out against European invaders for next 200 years. 1656 Dutch oust the Portuguese. 1796 Dutch surrender to British. 1802 Ceylon (the British name for the island) becomes a Crown Colony. British establish coffee plantations. 1815 Last king of Kandy is deposed and exiled to India. 1870 Coffee blight forces changeover of plantation system from growing coffee to growing tea. 1972 Ceylon changes name to Republic of Sri Lanka. 1985 Tamil Tigers (LTTE) emerge from Jaffna secessionist movement.